Navy Warship Stops to Let Whales Pass: What's it take to make the Navy's speedy new warship stop dead in its tracks? A few whales on a leisurely swim. 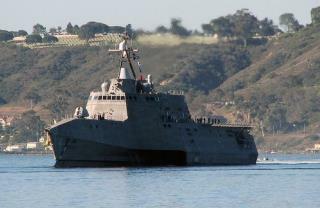 The USS Coronado ceded the right-of-the-way in a close call off the coast of Southern California, thanks to a warning radioed in from a whale-watching boat. Grandfather Writes His Own Obituary, and It's Awesome: The latest amazing obituary comes to us from Walter George Bruhl Jr., a Delaware man who penned his own before he died at the age of 80. Sample line: "Walt was preceded in death by his tonsils and adenoids in 1935; a spinal disc in 1974; a large piece of his thyroid gland in 1988; and his prostate on March 27, 2000." Toddler Uses FaceTime to Get Help for Mom: Bentley Toone, 2, had used FaceTime on his mother's iPhone to call her friend Connie Guerrero so often, Guerrero sometimes ignored the calls. But last week, "something inside of me just told me that I needed to answer," Guerrero says. It was a good instinct: The toddler didn't know how to call 911, but he was good at FaceTime, and he was thus able to get help for his mom. Passengers Save Baby Who Stopped Breathing on Plane: Not all this week's air travel news is gloomy. Two passengers saved the life of a baby who had stopped breathing aboard a US Airways flight. It helped that one was a CPR instructor. Lost Dog Found, Thanks to $1K Search: Bryan Mason was determined to find his dog after he ran off one day in San Francisco—and not with flyers alone. Mason set up a Google Map, pinning spots where Sparky had been sighted. He also created a Facebook page, which offered a reward and got 32,000 views. Then, using TaskRabbit, Mason gathered workers to distribute 2,500 flyers and 5,000 handbills. Luckily, he didn't have to use the gallons of urine he collected (he can explain) because Sparky is now home safe and sound, after $1,000 in search expenses.